With a bevy of awards proudly in hand, beloved children’s musician Sukey Molloy puts a big smile on traditional favorites and mixes them with original songs, poetry, and a story for the October 5 release of her fifth album, Five Little Oysters! 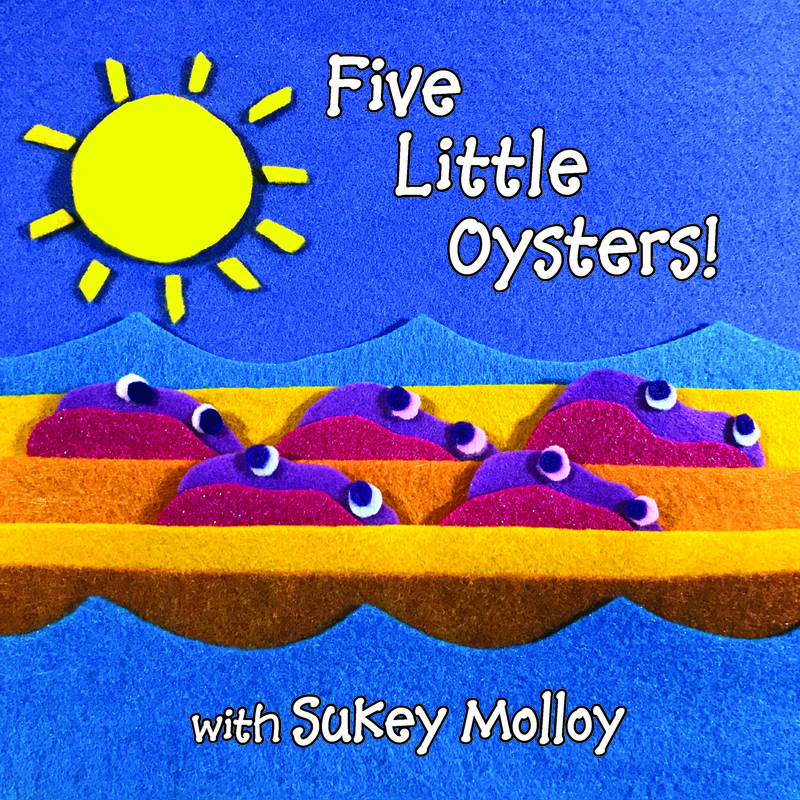 October 5 will also see the release of two companion audio picture books by Sukey Molloy: Five Little Oysters! and The Story of Little Flame in the Arctic. Featuring colorful felt art images, these books are designed to be read while listening and singing along to Sukey’s songs, courtesy of a song download link provided in each book. There are certain songs that should be part of the childhood experience for every child. With her new album Five Little Oysters!, Sukey Molloy turns tradition upside down, shining a new light of fun, fun, fun on this classic repertoire with updated lyrics, a seemingly endless flow of irrepressibly humorous sound effects, and many delightful punctuations from the percussion department guaranteed to produce a parade of giggles. All of this hilarity is imbued with the magic of the up-close, cheery, participatory style that has become Sukey’s calling card. 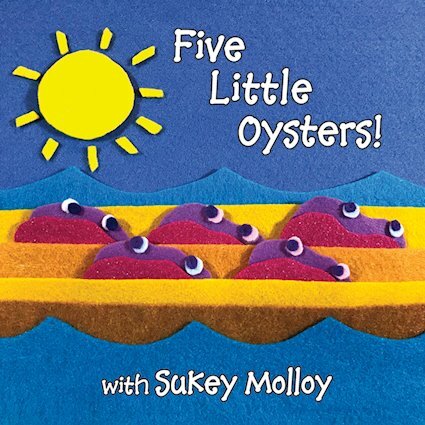 Joining Sukey as co-producer of Five Little Oysters! is Grammy-winner Larry Alexander (Diana Ross, Bruce Springsteen, Bon Jovi, David Bowie), who has served in this capacity for all five of Sukey’s albums. Together they have created a recording for children that will surely set the standard for years to come with its graceful flow from beginning to end and a clean, clear sound that echoes first-rate production values. The musical integrity of the album, the cultural significance of the classic material, and the sweet nuances of Sukey Molloy’s original lyrics and melodies present a trio of impeccable assets. Five Little Oysters! kicks off with “It’s Raining, It’s Pouring,” for which Sukey Molloy has adapted the lyrics to incorporate picture-perfect farm animal sounds and imagery, all set to a delightful Calypso beat. “Do Your Ears Hang Low” presents all of the little-known original verses frolicking in a carnival atmosphere. Whistles, cow moos, shuffling sandpaper blocks, cowbell, triangle, water stick, and bass drum partner with the physiologically absurd lyrics in describing almost every conceivable ear position, location, and characteristic! Other highlights include Sukey’s version of “She’ll Be Coming ‘Round the Mountain” (with a mighty fine fiddling interlude); “I’ve Been Working on the Railroad,” in all its rollicking, fee-fi-fiddley-eye-oh glory; and the all-time grandfather of counting songs, “This Old Man,” followed by a remarkably selfless rendition of “Simple Gifts,” done here with purity and reverence, just the way it should be. 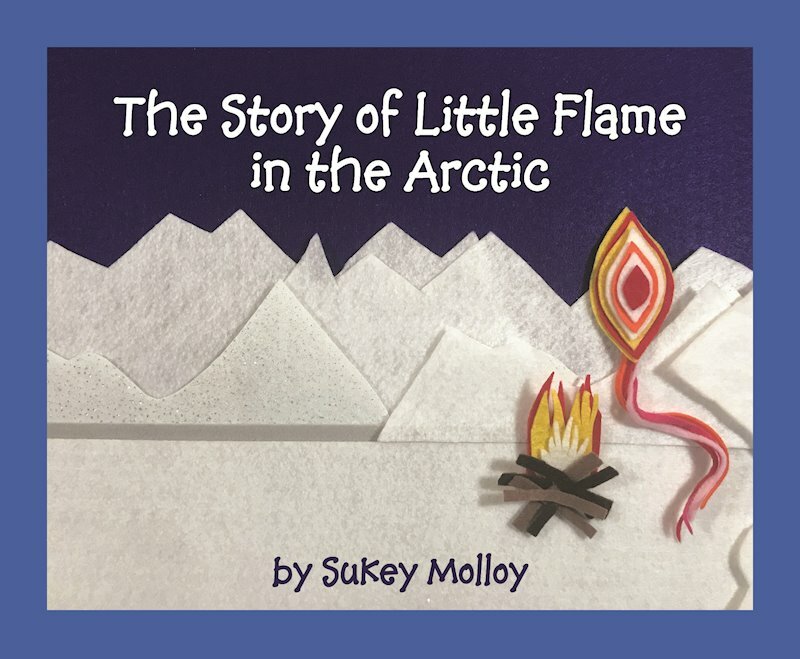 Sukey concludes the album by reading her perfectly enchanting “The Story of Little Flame in the Arctic.” Whether singing or speaking, Sukey Molloy’s crystal-clear voice imprints a smile on every track of this beautiful album. The Five Little Oysters! album will be available at Amazon, iTunes, sukeymolloy.com, and at retail outlets nationwide. The Five Little Oysters! and The Story of Little Flame books will be available at Amazon, Etsy, and sukeymolloy.com. Sukey Molloy’s award-winning body of work include the albums I Am Sleepy! with Sukey Molloy (2012; Parents’ Choice Silver Award, Mom’s Choice Gold Award), I Am Happy! with Sukey Molloy (2012; Creative Child CD of the Year Award, Mom’s Choice Gold Award, Preferred Choice Award), I Like to Sing! with Sukey Molloy (2007; NAPPA Honors Award), Circle Songs! with Sukey Molloy (2005; Children’s Music Web Award, Parent to Parent Adding Wisdom Award), and two Sukey’s Circle! DVDs (2009 and 2010; NAPPA Honors Award, Mom’s Choice Gold Award, Preferred Choice Award, NAPPA Rising Star Commendation). Q: How did you begin working with felt art? Why have you chosen to use felt art in your books and animated videos? Sukey: While teaching, and even while performing, I feel it is impolite to ask someone to sit and watch what I am doing and not offer the same opportunity. Some of my songs, like “Five Little Oysters” from my new Five Little Oysters! album and “Tick Tock” from my Circle Songs album, offer lots of different interactive activities, with felt art included! I initially began with one large felt board for the classes I teach and even built a gigantic board for the stage, and I then had the idea to give each child his or her own little felt board with pre-cut characters. After a while, I realized I could use my own felt creations to make audio picture books and, finally, video animations. 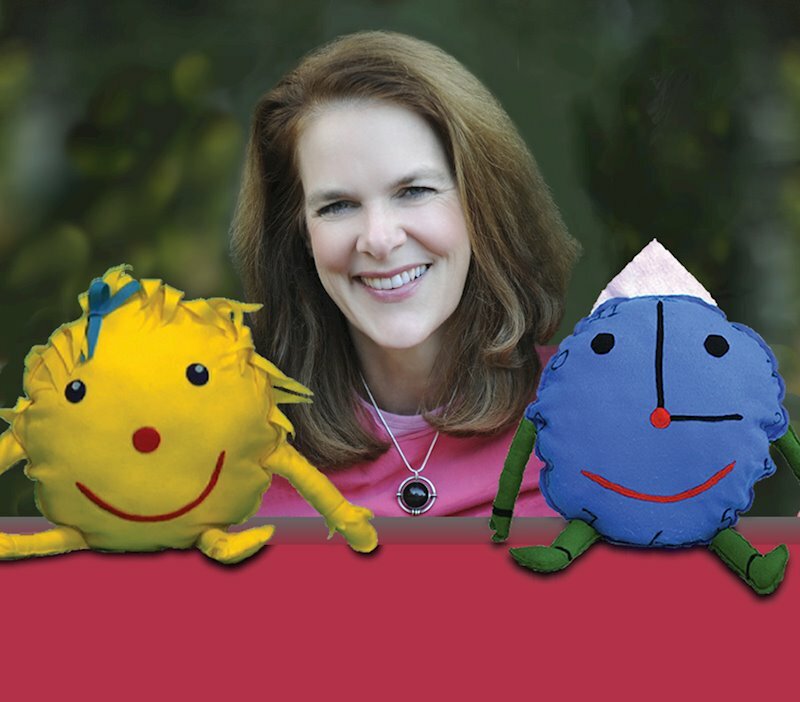 I even created a product called My Felt Kits, which includes story patterns, felt to cut, and song downloads. I find creating felt art very calming and ‘close to my essence.” I have an idea, sit down with felt squares in all colors, and begin cutting. Pretty soon there’s an oyster, or a sun, or a bird, or a caribou, and the storyboards grow from there. The amazing thing about felt is that it naturally adheres to itself, so the possibilities are endless! And it creates lovely picture book images to accompany my songs and stories. Q: What is your objective when singing or telling stories to children? Sukey: It is my greatest joy to captivate the attention of the child listener such that they are fully engaged in the moment with the activity at hand. Calling the attention of the child is an honor, an essential openness, an invitation to engage them in learning and developing through listening and participation. It’s essential to me that my music relates directly with the age group I am singing to. Otherwise I am performing, and that is never my aim. My aim is to create a relationship of sharing and interaction and engagement that allows learning while having fun. I am particularly interested in relating directly with the child when I sing, speak, and move, so that the child will feel invited to join in and sing and move along with me. Q: You pay close attention to imagery in your work. Tell us about that. Sukey: It’s so important for the child listener to be able to participate directly, at his/her own particular stage. This is why I use imagery that the child can hear and visualize easily such as simple movements, animal sounds, and lots of starts and stops in a song or story to draw the child’s attention back. I’m passionate about children actually being able to be part of the experience so it’s not running over their head. The song or the story should be ‘for them,’ not for me, not for the audience, but for each individual child who is listening or watching. Q: How do you describe your music? Sukey: My music is a mix of both original and traditional songs, along with original stories, and poems using the spoken word. It’s important to me that the child listener is not over-stimulated and that the pacing and rhythm and lyrics and sound relate to the essence of the very young. Celebrity Parents Magazine referred to me as the ‘modern day Fred Rogers’ and I can’t think of a higher compliment! Q: What makes you stand apart from other artists and authors? Sukey: I am told I have a ‘soothing’ voice and a gentle style that’s fun, childlike, intimate, up-close, and participatory, and my song lyrics and stories relate directly to the very young. 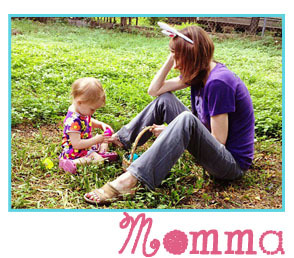 Parents report that children listen very attentively and ask to hear the songs and stories over and over again. I like to think that I have a natural, essential aspect that seems draw children into my orbit. It’s not so hard to entertain children, but it’s quite another thing to be in a real relationship with them. Just seeing the Fred Rogers movie, I’m reminded again of his saying that the space between the TV screen and the child viewer is sacred. I feel that way about music and stories, too. The space between the microphone or the book and the child listener is a very special space, a space to honor. It’s really important to me that my work invites children into listening but doesn’t fill up all the space that the child occupies. There needs to be room for the child to exist inside the song or story or poem. Q: Could you tell us a bit about how you make decisions about the songs and stories you present to children? Sukey: When I consider a song or story, I like to see what the song or story can do in terms of how far I can take it for learning, play, and/or creative imagination. I always ask myself, what can this song or story do for the child? Can it help the child grow or learn or feel or move? It’s also important to me that the content of an album or children’s book has a movement up and down in terms of intensity, and that at the end, the experience has landed the child back safely inside their own space with a kind of cozy, restful, satisfied feeling, like being on a journey of listening, and arriving safely home. Album Details: Five Little Oysters!